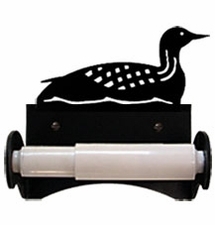 Our toilet tissue / paper holder features a loon / duck silhouette and is created of wrought iron with a baked-on powder coat finish for moisture resistance. The roller style holder is spring loaded. This American made toilet paper / tissue holder is handcrafted in Fabius, New York, by Village Wrought Iron.